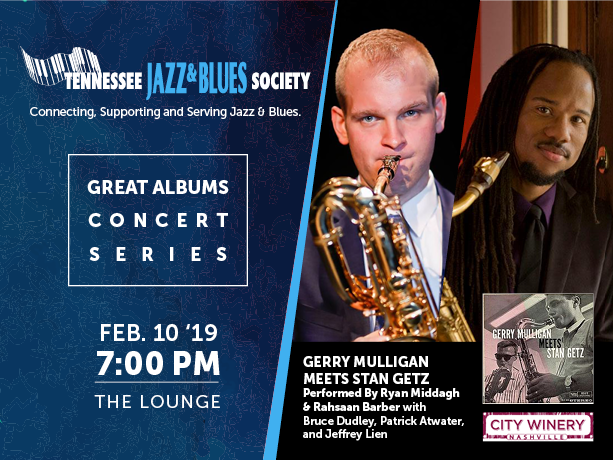 The Great Albums concert series continues with “Gerry Mulligan Meets Stan Getz” performed by Ryan Middagh and Rahsaan Barber. Sunday, February 10, 2019, in The Lounge at City Winery Nashville. Doors open at 5 pm and the show begins at 7 pm. Tickets are $20 and can be purchased from City Winery’s website soon. Ryan & Rahsaan will be joined by pianist Bruce Dudley, bassist Patrick Atwater and drummer Jeffery Lien. Gerry Mulligan Meets Stan Getz (also released as Getz Meets Mulligan in Hi-Fi) is an album by American jazz saxophonists Gerry Mulligan and Stan Getz featuring performances recorded in 1957 released on the Verve label. Ryan Middagh is the Director of Jazz Studies at the Blair School. An accomplished jazz composer and arranger, Middagh has received numerous commissions for high schools, colleges and professional musicians and ensembles throughout the country, and currently arranges music for Grammy-winning saxophonist Jeff Coffin. His music has been featured at the International Jazz Composers Symposium, been recorded by professional and collegiate ensembles, and several of his works are published by UNC Jazz Press. Tickets are available through the City Winery Website.